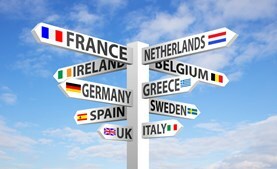 If you’re looking for your next travel destination, then look no further than Europe. From the beautiful coastline of Greece to the magnificent cathedrals of Spain, Europe has a lot to offer. It’s no wonder the continent is one of the world’s top vacation spots. When it comes to visiting Europe, there is no particular time when you should go. When you travel there depends on what kinds of activities you are looking to do. Most people travel during the summer months to take advantage of the warm weather and their vacation days. But, with the exception of popular ski regions and holiday attractions, travelers experience less crowds and lower travel costs during the winter months. Europe spans across 45 countries and each differ in geography and climate. The northern region, including the UK, the Netherlands, Denmark, Sweden, Finland and Norway, experience cold weather and heavy snowfall from December through March. Southern European nations, such as southern France, Italy, Spain, Portugal and Greece experience exceptionally hot summers. They mostly have sunny weather year round, but have more rainfall in the winter.